Maximum convenience, reliability and ease of service in a residential valve. Now it’s possible to service a Hunter valve without using any tools to gain access to the inner workings of the product. Products maintenance has never been easier. With this simplicity, you don’t give up any quality or performance as these valves boast more than enough features to handle the demands of whatever your site has to offer. The PGV Jar-Top features durable, high-grade, corrosive and UV resistant PVC contruction and a rugged double beaded, leak-proof diaphragm with support to prevent stress failure. Intuitive design makes it easy to access the valve; no tools necessary. Made of durable materials and stainless steel to resist wear. Adjusts the flow of each zone on a system to deliver optimum nozzle performance. 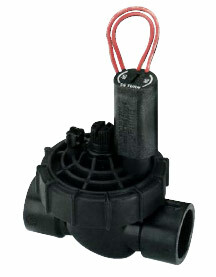 Diaphragm is interchangeable with PGV, SRV and ASV series 25mm valves; solenoid fits all Hunter plastic valves. Heavy-duty solenoid: 24VAC, 475mA inrush current, 230mA holding current, 50 cycles.